Hello, I have a mac OS Mojave & currently have a standalone license for 1PW 6. I downloaded 1PW7 & the mini extension as well. However, after doing all the downloads, I'm not able to upgrade my license (& purchase). I've downloaded several times but I'm not having any luck. It's obvious I don't understand what I'm doing & I'm extremely frustrated with myself. Please help!! You need a new licence for 1PW7. On the initial startup you should see a big green button saying Subscribe Now. Beneath that is a line in small print saying Need a Licence. We Have Those Too. Click on that and it will take you to a purchase page. But you should consider a subscription. There are quite a lot of advantages to a sub, see https://support.1password.com/why-membership/ . Of course, you may be one of those people who dislike subscriptions, or can't use their advantages for some reason. Did you download/install from us directly? Or from the Mac App Store? What did you mean by "mini extension?" From where did you get this? Because you shouldn't have needed anything in addition to the main app. Do you want just a new license? Or have you looked into a 1password.com membership? That's the best way to use 1Password for the vast majority of people. Hello Danco & Lars, thank you in advance for your responses. First of all, Danco, yes I want 1PW7 as a standalone. A membership subscription doesn't work for me. In a nutshell, I have low vision/legally blind & trying to use other devices to access my data is too time consuming & difficult. Lars 1) I downloaded 1PW7 from 1password website directly. I did the same with 1PW6. I attempted to install 1pw7 several times (after downloading & deleting several times too). 2) the 'extension for the mini or extension for my browser was from 1pw downloads. 3) I want a new license for a standalone - not a subscription for a membership. Even though it haas several features, a standalone will work better for me. I wouldlike to know how to go forward . This will put an installer in your Downloads folder. Run this installer to install 1Password 7. If it finds 1Password 6 installed it will set it aside in a zip file. Launch 1Password 7 from your Applications folder after the installation finishes. Unlock with the same Master Password you used for 1Password 6. 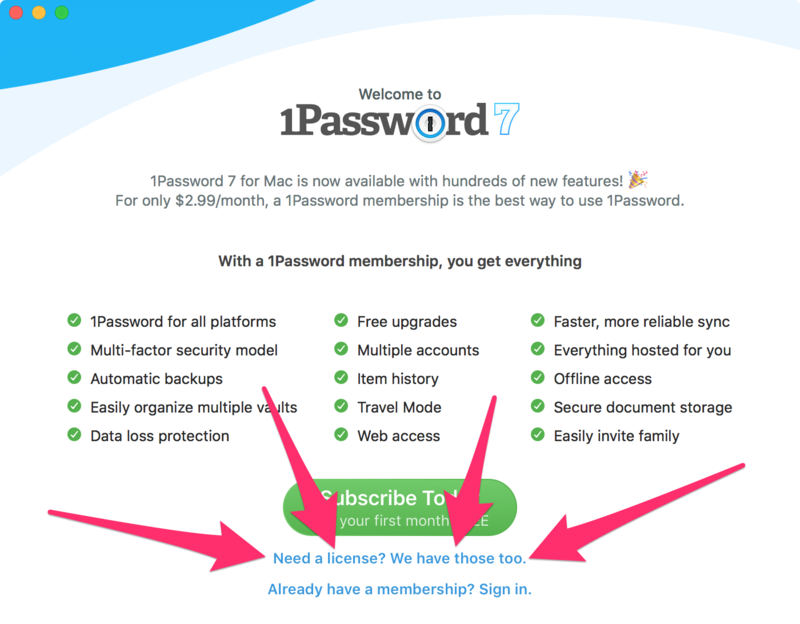 Click on the 1Password 7 menu in the menu bar and choose Purchase 1Password… from the menu that appears. The screen that appears will allow you to complete your purchase. If you run into any trouble please let me know. Thank you so much!! After a bazillion missteps, I've got it all downloaded & setup. I am still having problems signing in though. It's taken me several attempts to finally get here. Can you direct me to the correct spot to log in to the forum? Each time I click on "sign in to your account" I get a message that the username or email (not available) or password (incorrect), I can't seem to get to this spot. Again, thank you for helping me!! If you see that username/avatar, you don't need to sign in again. 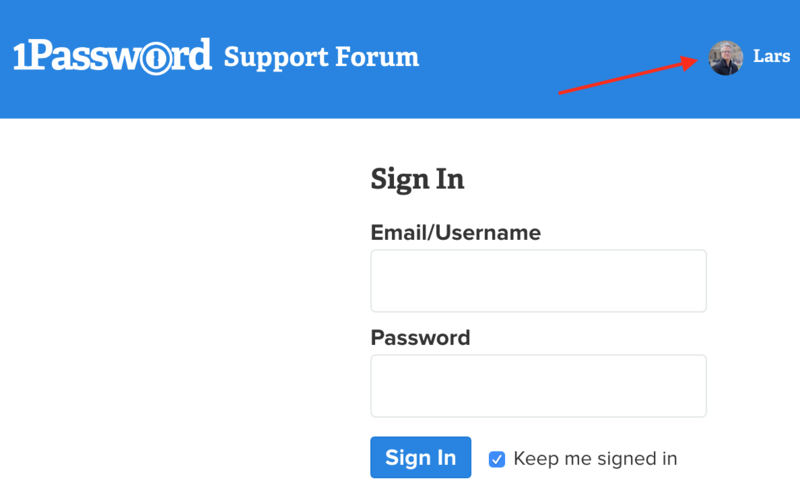 If you've clicked "Keep me signed in" on previous visits, you may find you're still signed in, if you did not specifically click the sign out link before closing the browser window the last time you visited. Lars, thank you so very much for your help. I've got it all set up now. @RJMJ - great! Glad I was able to help.